"We have a very boring investment strategy. We focus on matching the market’s performance by continually investing once or twice a month—no matter what." That’s when they got serious about early retirement. They ran the numbers, figured out a savings goal and dubbed the project their “10 Year Plan” (it ultimately took six). 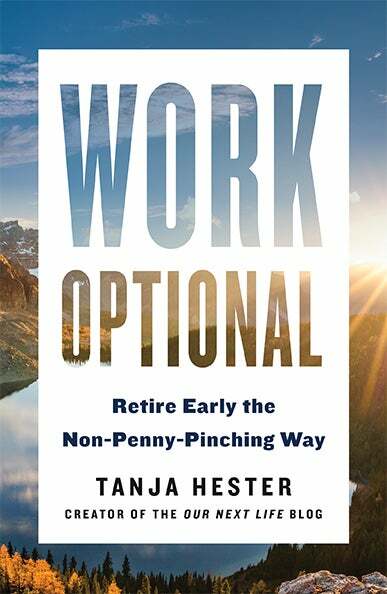 Once they crossed the finish line in 2017, they moved from L.A. to Lake Tahoe, where they’re hitting the slopes and hiking trails, traveling the world and pursuing passion projects—including Hester’s new book, Work Optional, available February 12. We caught up with Hester to learn how they achieved financial freedom—and how the rest of us can, too. Most people think extreme frugality is the key to early retirement, but you don’t pinch pennies. How did you make it work? Saving for retirement is a lot like decluttering your home. To use [tidying expert] Marie Kondo’s parlance, the things that don’t spark joy are easy to get rid of. Think about what you are currently spending on that doesn’t make your life better—coffee, impulse buys at the grocery store. We cut back on restaurants and got rid of cable. Then, look at where you get the most bang for your buck. For most people, the biggest expenditures are housing and transportation. If you can cut those back or not upsize when your income goes up, you can [save a lot]. We have always been relatively frugal on housing: We bought at the bottom of the market, [spent significantly less than we could have] and plan to stay here forever. And I still drive a 2004 Honda instead of trading up. How did you set yourself up for financial success leading up to retirement? Neither of us are naturally great savers, so we didn’t rely on willpower. We put automatic investments in place, so we never saw that money in our checking account. Every time we got a raise, we’d increase our investments and funnel more toward our mortgage. We also worked hard to increase our earnings. Focusing on earnings will help you a lot more than clipping coupons. You can supercharge things through side hustling, transitioning to a different career path...or being an entrepreneur. If you can keep your spending level while increasing your income and bank the difference, you can save money quickly. We started out saving one-third of our income, and by our last year at work, we had paid off our mortgage and were able to funnel huge amounts into investments. In your first year post-retirement, you’ve gone everywhere from Taiwan to Mexico to Paris. What’s your best cheap travel tip? Try Google Flights. You can price out your home airport for a given time period and put in a broad category of destination—Europe, Asia, the Middle East. For example, we knew we wanted to travel in January, and Google Flights showed us we could get the best value by going to Taipei. In November, Beijing and Paris came up as the best deals. If you don’t really care where you go, you can travel really well, really cheaply. Do you still earn money? I have a podcast and some sponsorships, which cover recording expenses. Last year Marc earned a little through a consulting side hustle. I used my book advance to fund our Paris trip. I’m not expecting to earn royalties, but if I do, maybe we’ll travel again, renovate our kitchen or donate to charity. How can people determine if early retirement is right for them? First, consider your earnings potential. [That] includes all the ways you can earn money: your main job, side hustles and any passive income or [other] streams you can create...Looking at all of that combined will tell you how quickly you can save and what forms of early retirement might be most appropriate. You might decide that full early retirement is too far off and choose to pursue semi-retirement instead. Then, track your spending for at least three months. If you can figure out a couple of categories where you’re spending mindlessly and [turn] that into several thousand dollars in savings a year, this pathway may be doable for you. Even if you don’t plan to retire early, finding leaky holes in your budget is an illuminating exercise. We have a very boring investment strategy. We focus on matching the market’s performance by continually investing once or twice a month—no matter what. We also opt for the lowest-fee index funds possible because fees are corrosive to your gains. As a child, I observed a “treat yourself” philosophy, so I didn’t go into adulthood with the best financial behavior. I spent more than I earned and ended up with credit card debt. A lot of people who see themselves as ‘bad at money’ think they can never change. I changed, but by not by developing miraculous willpower or becoming super frugal. I recognized my worst tendencies and created systems [to circumvent them]—like hiding money from myself, because if I never see it, I have a better chance of not spending it. This Q&A has been lightly edited for clarity and brevity.